Monsoon rains and heavy winds destroyed a Karen migrant school on the Thai Burma border last week. 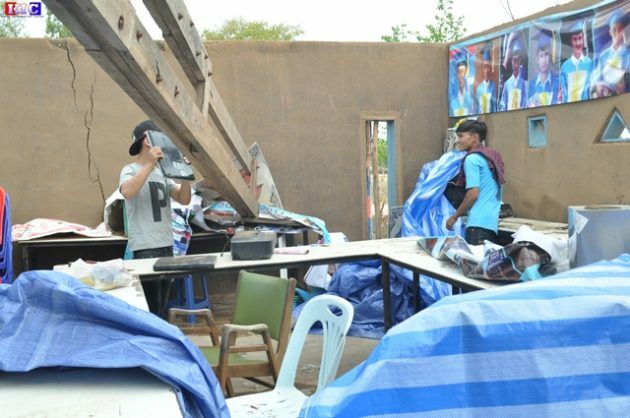 The school, Kwe Ka Baung, in Mae Sot in Thailand’s Tak Province, had its administration office and equipment wrecked by a twister on the 21st of May, during a heavy rainstorm. A Kwe Ka Baung school official told Karen News that they are in desperate need of a donor willing to help them repair the school building and replace equipment. Mahn Bala Shin, the director of the Kwe Ka Baung School said that the school has not received any aid to repair the destroyed school building. Kwe Ka Baung school is a self-reliant school and for two years ago, have managed to self fund the school. School teachers plan to approach former donors to seek help. Migrant schools on the border are mainly run with the support of international donors, but according to sources within the migrant communities, since 2013, the withdrawal of donors’ support for borderline organizations has forced several schools to close. The strong winds destroyed the school’s roof, walls are cracked and eight LED computer monitors, 10 CPUs, two printers and all the text books for primary to grade 12 were wet and destroyed in the deluge. Kwe Ka Baung School has received support from the Burmese Migrant Worker Education Committee for the school text books. The school teaches subjects include math, science, geography, Burmese, English, Karen and Thai languages and computer texts. Naw Paw Ray, the chairperson of the Burmese Migrant Worker Education Committee (BMWEC) said they will try to find donors to help rebuild the school. Kwe Ka Baung School was established in Mae Sot in 1990, with the purpose to teach Karen migrant children living in the border area to help preserve Karen traditional culture and literature. The school has 200 students registered for the 2016-17 academic year which will start in June.